“Altar of St. Anthony” is dedicated to the holy hermit, who lived in the III – IV centuries. in Egypt. Antony was revered as a defender of fires and a healer of diseases. The life of the saint tells us that at the beginning of his asceticism Anthony was tempted repeatedly by demons. Hieronymus Bosch showed here all the unrestrained and indefatigable of his fantasy in the invention of horrors and nonsense. Reality appears as a nightmare, the difference between living and non-living is lost: the witch’s body turns into a trunk of a rotten tree; from the earthen jar the horse’s legs grow; The plucked goose eagerly drinks, lowering the headless neck into the water; The hill turns out to be a giant standing on all fours, and a bird or fish – an aircraft or a boat. In the center of the composition – kneeling Anthony with a raised hand in blessing. Antony does not know fear, his faith is firm and strong. He knows that these monsters, devoid of inner strength, will not be able to overcome him. Antonia’s calm and strict face is drawn to the viewer. He seems to say to him: “Do not be afraid.” Bosch, like no other, was able to express the groundlessness of world evil: from above a bright, frightening coloring, and under it there is nothing. Right in front of the hermit stands a half-ruined tower, in the depths of which, at the foot of the cross, a figure of Christ is seen. It is almost invisible, but it is the semantic center of the triptych: all those who prayed before Christ at the altar looked at Christ with hope and faith. Among the ghosts and nightmares, in the hell the Savior does not leave believers in Him. He tells Antony calm conviction in the constancy of good, the saint passes it to the viewer. Description and meaning of the painting The altar of St. Anthony. 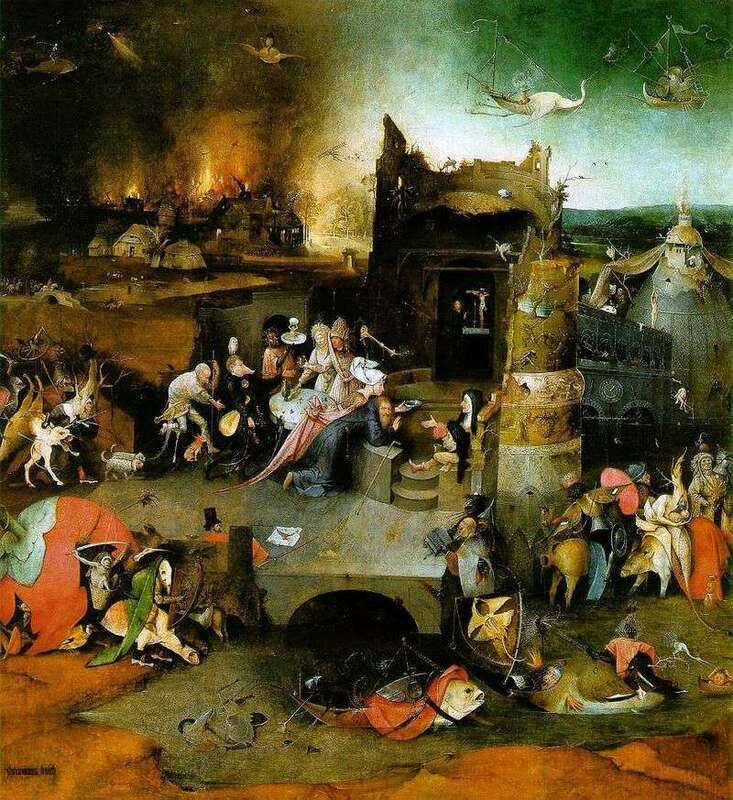 The central part of the triptych is Hieronymus Bosch.